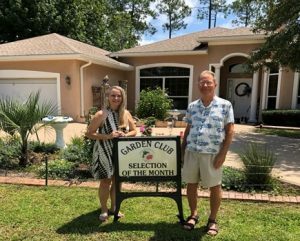 Linda and Dave Markey of Egan Drive have been recognized as September 2018 Selection of the Month by The Garden Club at Palm Coast. Dave moved to Palm Coast from Michigan in 1989. Linda moved from upstate New York in 2003. They both met in 2008 on eharmony.com fell in love and were married at Washington Oaks State Park in 2009. They purchased their home on Egan Drive in 2011. The home was closed for 2 years as the owners passed away and it took time for the estate to sell. Much yard work had to be done as the grass and gardens were mostly dead and a circular driveway had to be finished. The previous owner, a custom home builder, designed and built his “dream castle”. When his wife had died he built a brick castle memorial next to the house along with a Medieval Knight in shining armour. The Markeys decided to add a Medieval fountain along with a red Hibiscus, Firecracker plant and Morning Glory. Linda researched plants for a theme and chose English Rose Gardens. A center island was created with concrete brick shaped border. A Majesty Palm in the center, a bird bath with two blue birds surrounded by beautiful roses such as New Dawn, Don Juan, Perfume Delight, Black Magic, Cinco de Mayo and Spectra. Asiatic creeping Jasmine green and variegated were planted throughout the bed with Blue My Mind aka Blue Daze and Dwarf Morning Glory. A small battery operated fence had to be installed to keep deer out, they LOVE Roses! Inside lanai area you have 2 Shamrock plants Purple leaf with pink flowers and Green leaf Shamrock, Bromeliads, Pencil Tree, Peace Lily, Spider plant and Aloe. Outside pool area a bordered garden was created with Bird of Paradise, Gardenia, Hibiscus, Bush Daisy, Periwinkle, Pink Angel Trumpet, Red and Orange Camellia, Blue Agapanthus, Orange Milkweed and Mexican Petunias. Their latest addition was a beautiful wood arbor with Bleeding Heart vine, honey suckle, climbing red roses and white Jasmine. The Markeys worked hard to create a garden that gives them such joy in color and fragrance! This entry was posted in Garden Club, Yard of the Month. Bookmark the permalink.